The League of Assassins is dying to recruit a Talon. Well, technically other people are dying so they can recruit a Talon but the organization is quite anxious to enlist one of the shock troops for The Court of Owls. 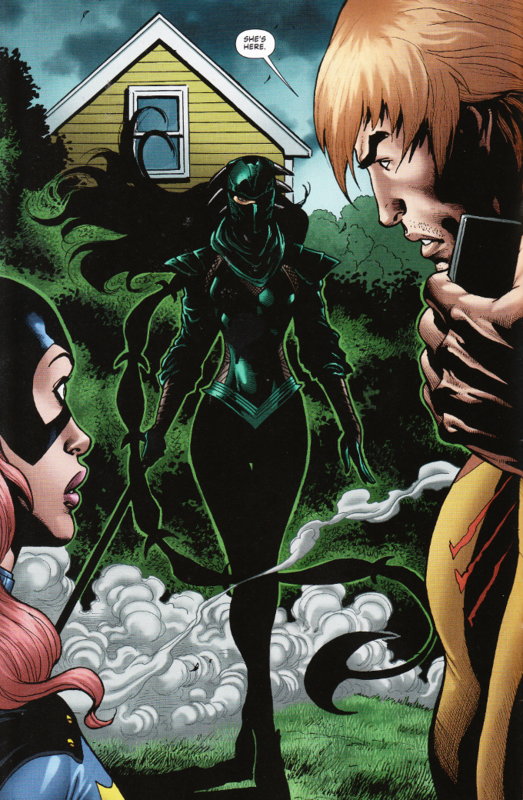 And they've sent Lady Shiva to enlist Strix... one way or the other. There's so much in this issue that I love. I love seeing Barbara Gordon written as a smart, competent crime-fighter. I love seeing Scandal and her two wives. But I think I love the final page of this issue most of all. No, I'm not going to show you or tell you what it is. But I will say that there's no small amount of irony that one of DC Comics most dark and generally twisted comics should be responsible for the return of one of the DCU's most happy and cheerful heroes... though he could be pretty twisted in his own way. In any case, I commend Gail Simone for this issue. Dale Eaglesham and Tom Derenick were two of my favorite artists before this series started. Their work on Secret Six has only increased my regard for their talents. Their styles are not exactly similar but unlike many series with multiple artists, there is no obvious visual discontinuity between their pages. The book's artwork is as great as its writing and I'll be sad to see it go post-Rebirth.